This article explores the opportunities of translating existing community engagement techniques into digitally augmented pop-up interventions, for on-the-spot feedback around infrastructure within the built environment. Pop-up interventions allow for more inclusive forms of community engagement through the combination of digital and physical media. The paper draws on Alexander et al. 's idea of pattern languages to put forward a set of design patterns for integrating digitally augmented pop-ups into community engagement activities. The patterns are based on a review and analysis of existing community engagement techniques, digital technologies used in urban environments, data from our own field studies and a focus group with engagement professionals. The aim of the patterns is to: (1) capture collective wisdom; (2) reuse and extend ideas; and (3) converge on designs that work for communities. Citizens of the 21st century live in a world where they are more connected than ever before, more exposed to an unprecedented amount of information and have a greater awareness of social, political and environmental complexities. As a result, engaging citizens in the urban planning process is not only a complex and divisive issue due to busy lifestyles and competing priorities, but also a result of top-down government approaches and current engagement tools and techniques used. Governments around the world undertake formal community engagement either as a legislative requirement or for the political interests and agendas of elected representatives (Cuthill, 2003). However, current practices, such as town halls, workshops, drop-in sessions and online platforms do not necessarily capture the opinions of the wider community and pose a number of other challenges. 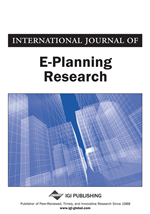 It has been shown that some of these traditional community engagement techniques are outdated, resource intensive, lack public interest and exclude certain demographics within local communities (Falco, 2016; Hosio, Goncalves, Kostakos, & Riekki, 2014; Sarkissian, Hofer, Shore, Vajda, & Wilkinson, 2009; Schroeter, 2012). As a result of this, time poor citizens, younger demographics and culturally and linguistically diverse people are either disengaged or excluded. Legally required community engagement and top-down decision making therefore rarely achieves genuine engagement outcomes, but rather fragments communities and creates dissatisfaction amongst citizens, who feel they have not been heard (Innes & Booher, 2004). Head (2007) argues that a greater dialogue between governments and citizens encourages deliberation between stakeholders in the decision making process. Within the last decade communities around the world have taken it upon themselves to drive bottom-up initiatives through temporary installations in the form of pop-ups. This contemporary approach is commonly referred to as pop-up urbanism (Fredericks, Tomitsch, Hespanhol, & McArthur, 2015), tactical urbanism (Lydon et al., 2014), guerrilla urbanism (Caldwell, Osborne, Mewburn, & Crowther, 2015) and DIY Urbanism (Caldwell & Foth, 2014). Pop-Up interventions ‘hack’ public space by appropriating new and temporary purposes within communities. They have the ability to attract passers-by, create awareness amongst citizens and stimulate the imagination of participants (Fredericks, Caldwell, Foth, & Tomitsch, 2015; Fredericks, Tomitsch, et al., 2015). Examples such as PARK(ing) Day (‘http://parkingday.org’, 2016), Build a Better Block project (‘Better Block’, 2016), Pop-up town halls (Lydon et al., 2014), and InstaBooth (Caldwell, Guaralda, Donovan, & Rittenbruch, 2016) demonstrate the successful application of pop-ups within public space. The design patterns proposed in this article build on these previous interventions and provide new insights into the use of pop-ups in conjunction with new digital technologies for community engagement. Existing digital technologies used within the built environment also offer opportunities to devise novel participation strategies that can engage previously difficult to reach, as well as new, segments of society in urban planning. Foth et al. (2009, p. 97) pose that “Information and Communications Technology has contributed to the globalisation of cities and facilitated increased contacts between places and people at both global and local levels.” Tomitsch (2014) discusses the evolution of information and communication technology (ICT) and its transition from the workplace into all aspects of daily life within the last decade, including the urban built environment. New digital technologies are providing numerous opportunities for the efficient use of existing infrastructure within the built environment. In this article, we contribute to these emerging fields through the development of eight design patterns that integrate digital technologies, pop-ups and urban planning.